Entertainment, fantasy and charm all come together at the Parque Gulliver de Valencia; Found in the Jardines de Turia, this children’s kingdom absorbs directly from sources of literature and combines them with nets, ropes, stairs, passageways, ramps and much much more providing a perfect entertainment center for children. The Gulliver is neither the biggest, oldest nor most complex park on Spanish territory, but is proud to be the only one in the world. Gulliver’s travels inspired the designers to come up with its unique design – A giant Gulliver tangled up in ropes, whose clothes and hair provide for gigantic slides where children can feel like genuine Lilliputians. If you wish to dive in to one of the more unusual corners of Europe, you cannot miss out on learning about some surprising facts about the Parque Gulliver. When the character made by Jonathan Swift shipwrecks and falls unconscious on the shores of Liliput, upon awakening he discovers tiny beings have taken him prisoner; This scene has been immortalized by the Parque Gulliver, where children can feel like true Lilliputians, climbing and sliding down the colossal figure which is no less than 70 meters in length – Impressive! The creation of this giant figure however, was not without its difficulties; Based on a design by Sento LLobell, architect Rafael Rivera and artist Manolo Martin, this monumental park began receiving growing concerns from both the citizens and the city council, who had recently changed its political status and frowned upon the projects of their predecessors – However as it began to take shape, a series of rumors emerged questioning parental associations, was it really dangerous? 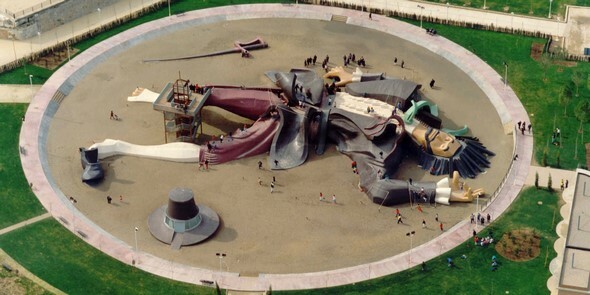 Over the years, these and other concerns raised began to fade, especially those that questioned children’s safety; The surfaces of Gulliver are built with soft, harmless materials, and its many dizzying slides have anti-slip coatings, not to mention the presence of monitors and nurses always on hand. Prohibited Not To Have Fun! But the Parque Gulliver doesn’t just consist of stairs, slides and ramps, it has many other attractions, such as mini golf, skating parks, bicycle lanes and a giant chess board – Something that is sure to impress! 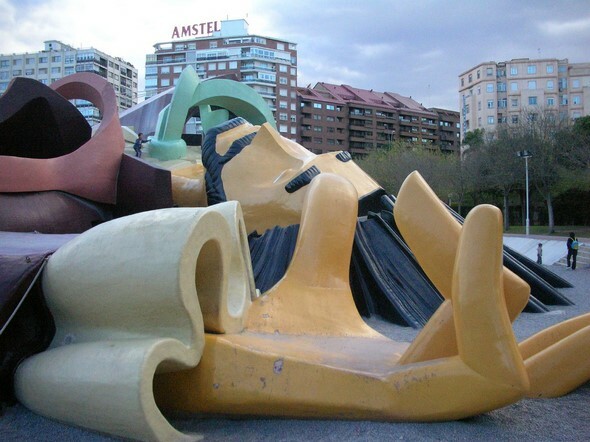 Without a doubt one of the more interesting facts about the Parque Gulliver de Valencia, is that Japan inaugurated an entertainment center in 1997 known as ‘Gulliver’s Travels’; It was the exact same design of an oversize Gulliver lying on the ground imprisoned by ropes, however sadly it was closed by the end of 2001. Since its inauguration in December 1990, this innovative park has witnessed innumerable events, such as seeing how the Valencian metropolis has evolved, which on more than one occasion has threatened its survival. Against all odds however, the Parque Gulliver de Valencia turns 26 this year – More than a quarter of a century of games, laughter and children’s entertainment. Although Valencia is host to other parks based on fictional characters (el Parque Mortadelo y Filemón, el Jardín de Blancanieves, etc. ), Gulliver’s park is considered one of the most loved by Valencian citizens, and as a result should come as no surprise that its considered a great tourist attraction. This entry was posted in Trips on 26 de December de 2016 by Miguel Padova. 3 studies about the benefits of summer camps that you won’t believe! Heaps of fun! 6 summer camp activities that you have to try!